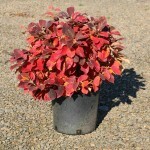 A small suckering shrub with thick dark green leaves that turn brilliant yellow, orange and red in the fall. The fragrant spring flowers are white, held in upright spikes, appearing before the foliage. Plant in full sun to part shade, in average, well-drained soil. It is useful for shrub borders, foundations, and in open woodland areas.